Tire size for a 710M - THE PORTAL HUB - Pinzgauers, Haflingers, Volvo 303s and more! 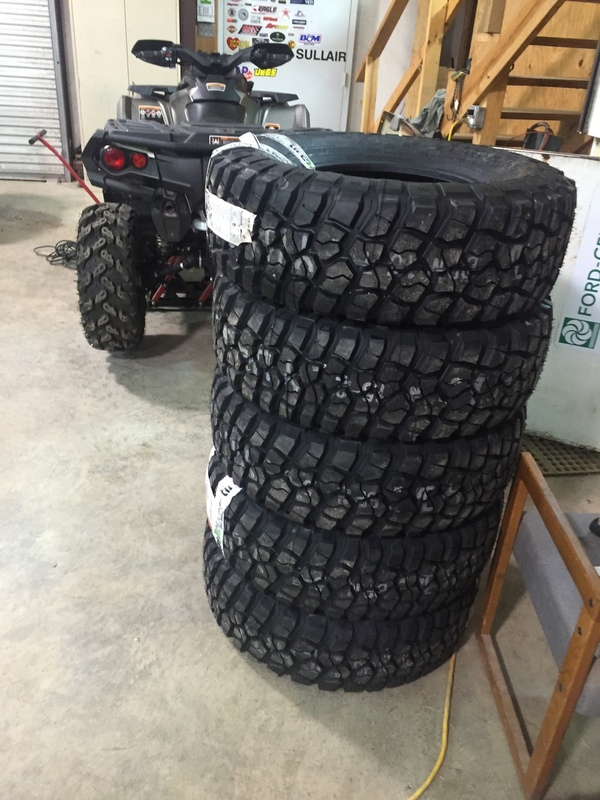 Has anyone had any experience with this size tire on a 710 Pinz? Having low pressure and the tire coming off the rim isn't much of a concern as I'm not into the rock climbing thing. With radial tires, the center doesn't wear differently at different tire pressures as as the radial belts keep the same (virtually the same) circumference at the middle as well as at each edge regardless of pressure. With bias ply tires this was an issue, but not so much with radials. I've ran 285/75R16 on the stock rims without any problem, except that the wider tire does make steering effort worse. The stock rims just pull in the sidewalls more. Unless you plan to run in very soft sand, I'd recommend using a 265/75R16 tire. This is even more common a size, and is less likely to cause some installers to take pause (they won't install tires that they feel are "too big" for the rim - for legal reasons). I'm using this size on both our 712W and 710M; the M did have 285s before (and the W had 295s!). After driving on the wider tires for years, I felt the need to return to a smaller, more "normal" sized tire for these trucks and felt that this was a good decision. Lastly, all the most recent tires on my trucks have been purchased from TreadWright and are retreads. I have not had a single tire issue with the retreads yet, after a combined 7 years of use. But my normal tire shop (America's Tire, same as Discount Tire) would not install the retreads for me (again, for "liability" reasons). I split a bottle of heavy Airsoft pellets between all the tires and had the tire shop put them in as they mounted them, and then didn't bother to balance as the pellets automatically balance the tires. Thank you for the response and the information. Do you by chance have any photos you can share showing these tires on your truck? Is the pellet trick to get around having to balance because the tire is not centered on the axle? I thought I read somewhere you had to have a special adapter to balance these wheels because of the portals? Is that correct? How large of a bottle of pellets are we talking, interesting trick I never heard of. I'll second the narrower tires. The portals have nothing to do with the balancing. What you have seen regarding a n adapter for balancing is due to the rims being LUG centric as opposed to the conventional hub centric. With most wheels the big center hole is used to center the wheel for balancing, with the Pinz an adapter is bolted to the wheel and the center hole in the adapter is used to center the wheel. Now after the long winded explanation, many owners have had no problems having new tires balanced on a standard balancing machine without using an adapter. Depends on the wheel. As Jim said the pellets work well. PINZDKH wrote: I'm looking to replace the five tires (incl spare) on my 710M. I have the factory wheels. From what I've seen on this forum, the most recommended size is 255/85r16. Availability is poor at best. Do you by chance have any photos you can share showing these tires on your truck? 265/75R16 on our 710M: http://real4x4forums.com/PinzgauerBBS/v ... f=9&t=9874. These are stock rims. Same size on the 712W (5th pic): http://real4x4forums.com/PinzgauerBBS/v ... =6&t=10008. These are custom 8" wide rims on stock Pinz rim centers. The pellets are just Airsoft pellets (plastic BBs for "toy" guns), they can be had in different weights. I think I used 0.20 gram pellets. They work this way: if you think of a tire that is heavier on one side, and you spin it, the heavy side pulls the tire and wheel out that direction as it spins, making it "wobble". Since the pellets are free floating inside, the tire "wobbles" out towards the heavy side, leaving the pellets behind so they slide around to the opposite side of the tire. So now the tire has a heavy side, and all the pellets congregate on the opposite side, adding weight on the light side to counter the heavy side of the tire and do the balancing automatically. So if you might expect to put 2 oz of lead weights on the rim to balance the tire, you need 2 oz of pellets inside to do the same thing (actually a bit less, since the pellets stay at the inside of the tread, further out than weights on the rim would be). Of course the pellets don't do anything until the tire spins fast enough to keep them thrown out against the tread, but tire balance is not important at low speeds. At high speeds they work great. A package like this gives 2.2 pounds of pellets: http://www.walmart.com/ip/Crosman-Airso ... t./9222912 and spit evenly, gives 5 oz of pellets split into 7 tires on a 712. I got antsy and ordered a set last night. If I would've seen Jim's pic first I probably would've gone with that size (265) but I decided to pop for the wider 285/75r16 in the BFG KM2. Will post pics once I get them mounted. Thanks for all the advice guys. I did the air soft pellets as well. bought the container, split them into 5 equal baggies and had the tire guys pour them into the tires when being mounted. Best deal around. You won't be sorry. I have the same tire but in 295 on the stock rims. They perform fabulously. Steering is not an issue as long as you don't try to move the wheel when stationary. Not a problem for us old guys who learned to drive on standard steering tractors but seems to be for the power steering crowd. Could be why they break tie rod ends too!? When you get the tires mounted I would be very interested to find out what you get as an actual footprint. As you can see from the attached photo my 295s are nowhere near 12 inches wide. With the suspension on the 710 set as it is I rarely even get the inside of the tread dirty. I will likely have the tires remounted at some point so I can wear out the inside too. I don't run heavily loaded so that likely contributes. PS I went with these because I got them barely used from a jacked up Dodge guy for a song. Hey that's great news! I'll post pics after I mount them and will try to remember to measure the footprint as well. I have Treadwright 245/75/16 retreads on a goodyear wrangler casing for a 9 inch foot print and I thought it was enough to get me through most things. Haven't thought of wider, though your print seems to be very wide was well.